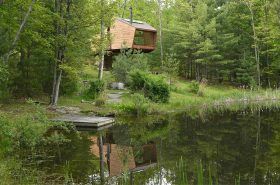 It might seem contradictory that hard, angular lines and pronounced geometry could enhance the organic nature of this forested Woodstock, NY location, but UK-based designer Antony Gibbons managed to pull the juxtaposition off seamlessly with his Inhabit Treehouse. Gibbons told Inhabitat that the small family home “still blends into the surroundings with its timber materials,” which includes cedar from the surrounding Catskills Valley for the facade and a reclaimed pine interior, where he used the sharp angles to frame out views of the nearby mountains and lake. 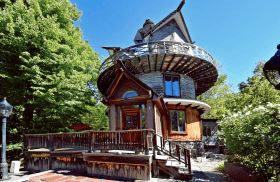 At the heart of this thoroughly trippy house near Woodstock, N.Y. are tales of the Muppets and Jim Henson, The Grateful Dead, and their biggest LSD supplier, and that’s not even the half of it. 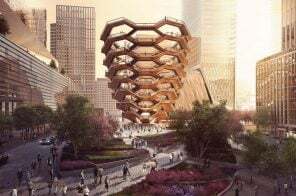 The real visionary here was the home’s first owner, artist, engineer and master set designer John Kahn, who built the one-of-a-kind house over 15 years. Kahn was a friend and collaborator of the late Muppet creator, and he designed sets for the “Fraggle Rock” touring company and more. Kahn used re-purposed materials including slate, copper, aircraft-grade aluminum and redwood as well as local wood and bluestone to craft this cylindrical work of art that never seems to look the same way twice. The three-bedroom home spans 3,518 square feet and is asking $1.2 million.